At all of the changes of time and season, the Queen of Fortune is present. She is the light on the darkest night of winter, the flame that marks the passage of time. She haunts the memories of another world when all that was of importance was in some way holy. Whether it be on the threshold of twilight, at summer’s end, at a ceremony of marriage, the birth of a child, or at the moment when the soul drifts slowly away into sleep, and finally, death, this goddess of the sun weaves on wings of white silken down, the fortunes of the world. It is no small wonder, then, that the unchangeable resoluteness of destiny was a province that fell under the auspices of the avian realm. The art of augury (‘the divining of omens’), the reading of the auspices (‘omens derived from the observation of birds’), (3) or, as at Dodona, the delivery of the prophecy by the birds themselves, (4) were employed to determine the will of the gods; to divine, if you will, a future that was already predestined. Understandably, the mythology of the bird as a whole is permeated with an eerie, otherworldly quality. The swan is no exception. What emerges as her dominant symbolic mode is a sometimes dark and foreboding image which manages, despite the gloom, to retain that ineffable magical aura that always surrounds the swan. The magical belief in the swan as a supernatural bearer of fate is chillingly dramatized in the telling of Manadh nan Eala, the ‘Omen of the Swans’ in the Scots-Gaelic Carmina Gadelica. Other traditions similarly designate Friday as propitious for marriages, and in many parts of the world the marriage rite was acknowledged by the gift of a swan as an emblem of love. Sometimes geese, who, like swans, were known for their faithfulness to each other, were given in place of swans, and this is the probable rationale behind the keeping of sacred geese in the Temple of Juno, (21) the Roman Goddess of Marriage. Generally speaking, Juno and Venus represent extreme opposite poles in their views concerning love and marriage. Whereas Juno is a staunch defender of monogamous marriage, Venus rules over the passions of desire regardless of one’s married state. In typical patriarchal fashion, Venus’s Greek counterpart, Aphrodite, has been described in negative ways, as an “alluring and seductive figure of fatal enchant-ment [who] rules over desire and over the seduction that leads to sin and destruc-tion.” (22) Love and death are thus united as complementary aspects of this goddess known for her extraordinary beauty. Based upon the images that depict her enthroned on the swan, as for example, a terracotta from 6th century B.C.E. Greece, (23) we can infer that the seemingly contradictory aspects of love and death attach equally to the symbolic constellations of both swan and goddess. announcing the dying moment with melodious cries. As is often the case in the naming of bird species, the word swan appears to be derived from this cry, its Indo-European root swen, meaning ‘to sound’, ‘to sing’. (25) The bird’s song is thus the voice of death. The famed ‘swan songs’, the last works of poets and composers so often imbued with a particularly touching pathos, are thus named after the dying swan’s song. In Hellenic myth, “swans were sacred to the goddess because of their white plumage, also because the V-formation of their flight was a female symbol, and because, at mid-summer, they flew north to unknown breeding grounds, suppos-edly taking the dead king’s soul with them.” (39) The annual carrying off of the king’s soul was a later aspect that became attached to the earlier mythology of the matriarchal/matrilineal practice of the periodic killing of the king, to bring it into line with the “seasonal transformations” of the solar year. (40) The notion that the sun is wheeled across the sky in a chariot drawn by swans, or that the swan escorts the sun to its place of rest, or place of death, is a very ancient idea. The mysterious place to the north, that amorphous land “beyond the north wind” where the sun always shines, (41) would have been the quintessential final resting place for the souls of kings. Faintly distant echoes of these unique Irish sagas seem to be audible in the 11th and 12th century Medieval French chansons de geste and Old French Romances, in the German Arthurian Grail cycles of the Swan Knight and, much later still, in the fairy-tales which take up the theme of enchantment in swan-form, and whose characters are even occasionally enchained with golden rings. (49) In all of these later settings, however, not only do the spellbound captives invariably tend to be male, but the original function of the swan as bearer of the sun has been long-since forgotten. A bizarre example is interwoven into Wolfram von Eschenbach’s masterpiece, Parzival, written between 1198 and 1212, (50) in which the chivalrous Swan Knight appears in the person of Parzival’s son, Loherangrin (who was to become Richard Wagner’s Lohengrin). (51) He is a Knight of the Grail who is not himself a swan, but who rides in a boat pulled by a swan to rescue a Lady in need. When “he whom the swan brought,” (52) as he is so undazzlingly described, lands on the Lady’s shores, his first act is to inform her of the irreversible taboo that has been imposed upon him – to warn her that she must “Never ask who I am; then I shall be able to remain with you. But if I am subjected to your question you will lose my love.” (53) The curse itself presents an interesting generational quandary, for whereas the young Parzival had failed to ask the appropriate question to free the Grail King from his agony, this Knight is not permitted to answer the question of who he is. The maiden is sometimes “rescued” from her swan phase by a male figure who steals the garment of feathers that she has left on the shore while she bathes. In nearly all of the Asiatic and European versions of the world-wide motif, “the swan maiden marries the youth who finds and steals her swan garb on the shore.” (55) But even after the “hero” has succeeded in his task, “the swan brides will always tend to resume their feather garment and fly away. . . .” (56) The elusive action of the swan bride stems from the problem of her eternal condition of being suspended between two worlds, always on the threshold of change. qualities of the bride in the behavior of Penelope in the Odyssey of Homer. her face’, (57) has also been interpreted as meaning ‘wild goose’. (58) And a “wild goose chase” was precisely what the faithful Penelope arranged for the many suitors who pursued her in Odysseus’s long absence. Thinking her husband dead, but hoping against hope that he was not, she had promised to choose another when her weaving was done. But her weaving was never done. By secretly unravelling in the darkness of night, the weaving she had done by day, Penelope was able to ward off the impending day of fate. The mysterious garment that she created by the light of day and then destroyed at the setting of the sun, was her wedding veil. Leda’s other children, whose birth stories have, themselves, engendered numer-ous disputes regarding their paternity, are Agamemnon’s wife and murderer, Clytaemnestra, “hatched, with Helen, from a second egg,” (66) and the inseparable Castor and Polydeuces (Pollux), (67) the identical twins who were so devoted to each other that when one died, the other asked to go with him and so were trans-formed into the brilliant “double stars” (68) of the heavenly constellation of Gemini. The association of the goose, and sometimes the swan, with the archetype of the witch is so ancient and so prevalent that a bit of 17th century folklore wisdom tries to assures us that the goose is not really a witch, but merely a diviner of rain: “She is no witch, or astrologer, to divine by the starres, but yet hath a shrewd guesse of rainie weather, being as good as an almanack to some that beleeve her.” (69) However well-intentioned this attempt may be, we are assured from long experience that she is indeed a witch, or at the very least, the familiar of a witch. The darker side of the goose-witch archetype is far more prevalent than that of the story-telling mother-crone. In the folklore of Wales, for example, we find evidence of a most ominous association in the belief that if geese were seen on the waters at night, most particularly on “the first Thursday night of the lunar month,” they were assumed to be witches. The occurrence of such a sight portended evil. (76) The Welsh belief closely parallels the Irish superstition expressed in the Manadh nan Eala, the ‘Omen of the Swans’. Such demonic qualities are attributed to the goose in Greek art where the long-necked bird is shown in the company of the Gorgon, whose name means literally, ‘terrible’, or ‘fierce’, but whose hideously beautiful face is emblazoned in nu- merous places as a protection against evil. In Greek mythology the three Graiai (‘Grey Ones’), ‘the Old Ones’, are the older sisters, or crone aspect, of the triple Gorgon. They are aged swan-maidens, white-haired crones who share but one eye and one tooth, which they pass between them as they stand guard over their younger sisters, the triple Gorgons. The Graiai were born old, which is to say that they were white-haired, or “grey from their birth.” (78) The grey hair with which they were born hints at the dark plumage of the new-born cygnet. Curi-ously, all the words for cygnet, which is the diminutive of cygne, or ‘swan’, derive from the Greek word kyknos, meaning originally, ‘the white one’. In European Jewish tradition the goose was taboo only at certain times of the year. The belief that death would come to anyone who killed the bird during the months of the Winter Solstice, that is “from about the middle of December to the middle of February,” was little understood, but strictly adhered to. (90) This practice is a clear indication that the goose represented the sun, and that the slaying of the goose was equated with the killing of the light in the darkest days of the year. A semi-Christianized adaptation of this belief makes its survival known at the end of the Macy’s Thanksgiving Day Parade in New York City when Santa Claus arrives in an antique sleigh in the form of a “winter snow goose” (91) who embraces Santa in its enormous wings. The timing is perfect, for at this moment of the year, the sun is moving towards the Winter Solstice of December 21st or thereabouts, which marks the precise point at which the sun begins to offer the hope of longer days. Before the church usurped her worship, Brigid was one of the most important goddesses in all of Ireland, and certainly the most beloved. This fiery goddess who was looked upon as a deity of healing and poetry and smiths, was known as the ‘Bride of the Golden Hair’ in Gaelic Scotland where she was remembered as a white swan. (96) In a prototypical bardic exchange of “I Am” speeches as re-corded in the Carmina Gadelica between Bride and a male speaker who imag-ines himself as a deer, the goddess speaks to us in a most unequivocal manner about her shimmering whiteness and about her power, setting the record straight for once and for all. 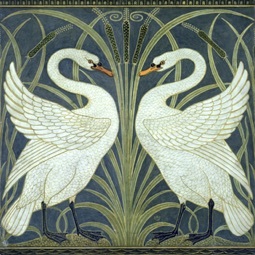 FRONTISPIECE: WALTER CRANE (1845-1915) SWAN, RUSH AND IRIS, 1875 WALLPAPER DESIGN. THIS ARTIST IS FAR BETTER KNOWN FOR HIS UBIQUITOUS ILLUSTRATIONS FOR CHILDREN’S BOOKS. IMAGE IN PUBLIC DOMAIN, COURTESY OF WIKIMEDIA COMMONS. 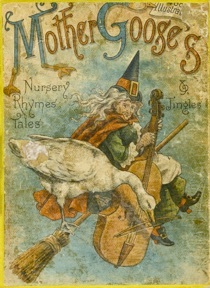 ILLUSTRATION UNDER THE HEADING “THE GOOSE AND THE WITCH”: 19TH CENTURY BOOKCOVER OF MOTHER GOOSE’S NURSERY RHYMES, TALES AND JINGLES. (LONDON AND NEW YORK: FREDERICK WARNE AND CO., NO DATE). COLLECTION OF THE AUTHOR. 1. Robert Graves, The White Goddess: A Historical Grammar of Poetic Myth. (New York: Farrar, Straus and Giroux, 1974, 7th Printing of Amended and Enlarged Edition of 1966), p. 412, quot. Alexander Carmichael, Carmina Gadelica. Graves does not annotate his source, but this quotation from Bride is very similar in tone to a selection of “curses” listed in Vol. III of the Carmina Gadelica in the section entitled Ora nam Buadh, (‘Invocation of the Graces’). See: Alexander Carmichael, Carmina Gadelica: Hymns and Incantations, op. cit., in the Preface by John MacInnes, p. 15, and the invocation on pp.36-37. 2. John Pollard, Birds in Greek Life and Myth (London: Thames and Hudson, 1977), p. 116, quot. Aristophanes, The Birds, 719. 3. See: Tracy Boyd, “Teiresias, The Androgynous Seer: A Question of Balance”, especially under the headings: “Amazing Grace” and “The Art of Augury”, at <www.sacredthreads.net>. 4. See: Tracy Boyd, “The Oracular Oak at Dodona” at <www.sacredthreads.net>. 5. Anne Ross, Pagan Celtic Britain: Studies in Iconography and Tradition. (New York: Columbia University Press, 1967), p. 331, (whose translation this is), quot. Carmichael in Benbecula. The story was told by a person living in Benbecula in the outer Hebrides of Scotland, to Alexander Carmichael who collected and recorded some six volumes of Scots-Gaelic material in his 19th century Carmina Gadelica. Available in a much-condensed English version: Alexander Carmichael, Carmina Gadelica: Hymns and Incantations. (Hudson, NY: Lindisfarne Press, 1992; Revised 1997), in which a very slightly different translation appears as No. 205 on pp. 177-78. 6. Anne Ross, Pagan Celtic Britain: Studies in Iconography and Tradition, op. cit., p. 331. 7. Gertrude Jobes, Dictionary of Mythology Folklore and Symbols. Two Volumes. (New York: The Scarecrow Press, Inc., 1962. ), “Friday”, Vol. 1, p. 611. 8. H. R. Ellis Davidson, Gods and Myths of Northern Europe. (Harmondsworth, Middlesex: Penguin Books Ltd., 1964-1975), p. 111. Hilda Davidson is a well-worth reading authority on all things having to do with the religions of northern Europe, including the participation of women in ritual, etc. 10. Webster’s New World Dictionary of the American Language. College Edition. (Cleveland and New York: The World Publishing Co., 1959), “Friday”, p. 580. 11. The details are spelled out in an excellent, rather complicated article worth a serious read at: <http://en.wikipedia.org/wiki/Frija-Frigg>. 12. H. R. Ellis Davidson, Gods and Myths of Northern Europe, op. cit., p. 111. 14. See: Tracy Boyd, “The Keepers of the Flame: Vesta and Her Brides”, under the heading “The Dawning of the Summer Solstice” at <www.sacredthreads.net>. 17. Robert Graves, The Greek Myths. Two Volumes. (Baltimore: Penguin Books, Inc., 1960), Vol. I, “The Pelasgian Creation Myth” 1.3, p. 29. 18. See: Gertrude Jobes, Dictionary of Mythology Folklore and Symbols, op. cit., “Friday”, Vol. 1, p. 611. 19. See: Raphael Patai, The Hebrew Goddess. (Ktav Publishing House, Inc., 1967), pp. 195-97. 20. Joshua Trachtenberg, Jewish Magic and Superstition: A Study in Folk Religion. (New York: Atheneum, 1975), p. 253. 21. See: Maria Leach, Editor. Standard Dictionary of Folklore, Mythology, and Legend. Two Volumes. (New York: Funk & Wagnalls Company, 1949), “goose”, Vol. I, p. 460. 22. Erich Neumann, The Great Mother: An Analysis of the Archetype. Ralph Manheim, Trans. (Princeton: Princeton University Press, Bollingen Series XLVII, 1970), p. 172. 23. See: Buffie Johnson, Lady of the Beasts: Ancient Images of the Goddess and Her Sacred Animals. (San Francisco: Harper & Row Publishers, 1988), Fig. 91, p. 78. 24. Sylvia Bruce Wilmore, Swans of the World. (New York: Taplinger Publishing Company, 1979), p. 46. This is the book on swans, a kind of “everything you always wanted to know but were afraid to ask” compilation. 26. I am indebted to Fiona Saint of Devon, England, for making me aware of this plaintiff madrigal and for sending me the words. Orlando Gibbons, The Silver Swan, first published in his First Set of Madrigals and Motets of 5 Parts in 1612. (Grove’s Dictionary of Music and Musicians. J. A. Fuller Maitland, Editor. Five Volumes. (Philadelphia: Theodore Presser Company, 1926), “Orlando Gibbons”, Vol. II, p. 166. 27. Classicist and ornithologist extraordinaire, D’Arcy W. Thompson, in his voluminous A Glossary of Greek Birds, (Oxford: Oxford University Press, 1936, reprinted Georg Olms Verlagsbuchhandlung, 1966), sites almost three and a half pages in tiny print of Greek and Latin examples under the “Kyknos” sub-heading “The Swan’s Song”, pp. 180-183. 28. Aeschylus, Agamemnon. E. D. A. Morshead, Translator. The Complete Greek Drama. Whitney J. Oates and Eugene O’Neill, Jr., Editors. Two Volumes. (New York: Random House, 1938), lines 1444-45, p. 216. 29. Robert Graves, The Greek Myths. Two Volumes. (New York: George Braziller, Inc., 1959), Vol. II, “The Foundation of Troy”, 158.q., pp. 263-64. 30. John Pollard, Birds in Greek Life and Myth. (London: Thames and Hudson, 1977), p. 145. 31. Ibid., quot. Aelian, De Natura Animalium, XI, I. 32. John Pollard, Birds in Greek Life and Myth, op. cit., p. 145. 34. John Pollard, Birds in Greek Life and Myth, op. cit., p. 145. 35. Ibid., quot. Aelian, De Natura Animalium, XI, I. 36. W. B. Lockwood, The Oxford Dictionary of British Bird Names. (Oxford: Oxford University Press, 1993), “swan”, p. 150. 37. D’Arcy W. Thompson, A Glossary of Greek Birds, op. cit., “The Swan’s Song”, p. 183. 38. Cited in John Pollard, Birds in Greek Life and Myth, op. cit., p. 145. But this translation is from another source: Homer, XXI Hymn to Apollo, 1., in Hesiod The Homeric Hymns and Homerica. Hugh G. Evelyn-White, Trans. (Cambridge, MA: Harvard University Press. The Loeb Classical Library, 1954), pp. 446-47. 39. Robert Graves, The Greek Myths. op. cit., Vol. I, p. 126, citing Euripides, Iphigeneia Among the Taurians 1095 ff. ; Homer, Iliad ii. 783; Hesiod, Theogony 295 ff. ; Apollodorus : ii. I.2. 40. See: Robert Graves, The Greek Myths. op. cit., Vol. I, p. 126. 42. For a thorough discussion of these ideas as they pertain to the Greek Sirens and the Egyptian Ba, see: Jane Harrison, Prolegomena to the Study of Greek Religion. (New York: Meridian Books, 1955. Originally published in 1903, then 1908, and again in 1922), p. 201; and for further in-depth discussion, see: Tracy Boyd, “By My Voice I Shall Be Known” at www.sacredthreads.net>. 43. Jane Harrison, Prolegomena to the Study of Greek Religion, op. cit., p. 201. 45. Anne Ross, Pagan Celtic Britain: Studies in Iconography and Tradition, op. cit., p. 307. 46. For the full story and further discussion, see: Tracy Boyd, “The Mythic Ground of the Longing for Wisdom and Love in William Butler Yeats’s The Song of Wandering Aengus” at <www.sacredthreads.net>. 48. Anne Ross, Pagan Celtic Britain: Studies in Iconography and Tradition. op. cit., pp. 305-06. Ross discusses both the literary traditions and the archaeological evidence and was the first to make the distinction between the Irish swan-maidens and those of other cultures. See, especially, her chapter, “Sacred and Magic Birds”, pp. 302-311. 49. Some of the details of these stories are offered in the informative article by an anonymous author at: <http://en.wikipedia.org/wiki/Knight_of_the_Swan >. 50. Wolfram von Eschenbach, Parzival: A Romance of the Middle Ages. Translated and with an Introduction by Helen M. Mustard and Charles E. Passage. (New York: Alfred A. Knopf, Inc., and Random House, Inc., Vintage Books Edition, 1961), Intro., p. xii. 52. Wolfram von Eschenbach, Parzival: A Romance of the Middle Ages, op. cit., Book XVI, lines 824ff., p. 429. 54. The author was Johann Karl August Musäus <http://en.wikipedia.org/wiki/Princess_Odette_(Swan_Lake)>. 55. Maria Leach, ed., Dictionary of Folklore, Mythology and Legend. op. cit., “swan maiden”, Vol. II, p. 1091. 56. Marie-Louise von Franz, The Feminine in Fairytales. (New York: Spring Publications, 1972), p. 122; and pp.114-128 passim re Grimms’s The Six Swans and The Seven Ravens. 57. Robert Graves, The Greek Myths, op. cit., Index: “Penelope”, Vol. II, p. 404. 58. A. B. Cook, “The Cretan Axe-Cult Outside Crete”, in Transactions of the 3rd International Congress for the History of Religions. (Oxford: Clarendon Press, MCMVIII), Vol. II, p. 194. 59. Robert Graves, The Greek Myths, op. cit., Vol. I, “Leda” p. 207. 60. See: Ibid., Vol. I, “Tyche and Nemesis”, 1., 2., pp. 125-26. 61. Ibid., Vol. I, p. 126. 62. Ibid., Vol. I, “Leda” p. 206. 63. Ibid., Vol. I, p. 208. 64. Ibid., Vol. I, “Tyche and Nemesis”, p. 125. For further discussions of the egg(s), see: Vol. I, “Leda” p. 206-07. 65. William Butler Yeats, Leda and the Swan, from The Tower, 1928. Public Domain. 66. Robert Graves, The Greek Myths, op. cit., Vol. I, “Leda” p. 207. 68. See: Richard Hinckley Allen, Star Names: Their Lore and Meaning. (New York: Dover Publications, Inc., 1963 Unabridged and corrected republication of G. E. Stechert’s Star-Names and Their Meanings, 1899), “Gemini”, p. 232. 69. W. Hazlitt Carew, Faiths and Folklore of the British Isles. Two Volumes. (New York: Benjamin Blom, 1965 reprint of 1905 Edition), “Goose”, Vol. I, p. 284, quoting Strange Metamorphosis of Man, 1634. 70. Northcote W. Thomas, “Animals: Goose” in Encyclopaedia of Religion and Ethics, James Hastings, ed. (Edinburgh: T. & T. Clark, 1912), Vol. 1, p. 518. 71. Humphrey Carpenter and Mari Pritchard, The Oxford Companion to Children’s Literature. (Oxford: Oxford University Press, 1984), “Mother Goose”, pp. 362-63. 73. William S. Baring-Gould and Ceil Baring-Gould, The Annotated Mother Goose: Nursery Rhymes Old and New, Arranged and Explained. With Introduction and Notes by the Baring-Goulds. (New York: Bramhall House, a Division of Clarkson N. Potter, Inc., 1962), p. 17. 74. Ibid., pp. 16-17. The formal name of this Frankish queen, who was born sometime between 710 and 727 and died in 783, was Bertrada of Laon. She was also known as Bertha Broadfoot, or ‘the queen with the goose-foot’. Charlemagne honored her by burying her at the magisterial Abbey of Saint-Denis founded by Dagobert I. See: <http://en.wikipedia.org/wiki/Bertrada_of_Laon>. 75. William S. Baring-Gould and Ceil Baring-Gould, The Annotated Mother Goose: Nursery Rhymes Old and New, Arranged and Explained, op. cit., p. 17. 76. Anne Ross, Pagan Celtic Britain: Studies in Iconography and Tradition. op. cit., p. 343, quot. John Rhys, who quotes from an essay on Welsh folklore by E. Lloyd-Jones, 1880. 78. Hesiod, Theogony, 270-76, in Hesiod, The Homeric Hymns and Homerica. Hugh G. Evelyn-White, Trans., op. cit., pp. 98-99. 79. H. E. D. Blakiston, “Graiai”, in Encyclopaedia of Religion and Ethics. James Hastings, Editor. (New York: Charles Scribner’s Sons, n.d. ), Vol. VI, p. 385. 80. A Greek-English Lexicon. Compiled by Henry George Liddell and Robert Scott. (Oxford: Oxford University Press, 9th Ed., with a 1968 Supplement, 1983) “Deino”, p. 374. 81. H. E. D. Blakiston, “Graiai”, in Encyclopaedia of Religion and Ethics, op. cit., Vol. VI, p. 385. For further discussions of the Graiai and their other triadic sisters, see: Tracy Boyd, “The Oracular Oak at Dodona” at <www.sacredthreads.net>. 82. See: Tracy Boyd, “The Eye Goddess and the Evil Eye” at <www.sacredthreads.net>. 83. Frederick Thomas Elworthy, The Evil Eye: The Origins and Practices of Superstition. (New York: The Julian Press, Inc., 1958), p. 89, and Note 133. 84. Maria Leach, ed., Standard Dictionary of Folklore, Mythology, and Legend, op. cit., ‘goose’, Vol. I, p. 460. It was the Barnacle Goose that was eaten in Donegal. 86. See Fact. No. 78 at: <http://www.fashion-era.com/royalty/80_facts_queen_elizabeth_2.htm>. 87. <http://en.wikipedia.org/wiki/Swan_Upping>, which also notes that the current practice is restricted to the waters of the Thames only. 89. For the minute details, see: Sylvia Bruce Wilmore, Swans of the World, op. cit., pp. 69-72, and 74-75. 90. Joshua Trachtenberg, Jewish Magic and Superstition: A Study in Folk Religion, op. cit., p. 258. 91. Amazingly, “winter snow goose” was the exact phrase used by the announcer! 92. The translation of her name is by Miranda J. Green, Dictionary of Celtic Myth and Legend. (London: Thames and Hudson Ltd., 1992), “Brigit”, p. 50. 93. Barbara G. Walker, The Woman’s Encyclopedia of Myths and Secrets. (San Francisco: Harper & Row, Publishers, 1983), “Brigit, Saint”, p. 118. 94. Robert Graves, The White Goddess: A Historical Grammar of Poetic Myth, op. cit., p. 143. 95. Translation of her name is from Anne Ross, Pagan Celtic Britain: Studies in Iconography and Tradition, op. cit., p. 305. For a very detailed discussion of this family, see: Tracy Boyd, “The Mythic Ground of the Longing for Wisdom and Love in William Butler Yeats’s The Song of Wandering Aengus” at <www.sacredthreads.net>. 96. Robert Graves, The White Goddess: A Historical Grammar of Poetic Myth, op. cit., p. 394. 97. Ibid., p. 412, quot. Alexander Carmichael, Carmina Gadelica. Graves does not annotate his source, but this quotation from Bride is very similar in tone to a selection of “curses” listed in Vol. III of the Carmina Gadelica in the section entitled Ora nam Buadh, (‘Invocation of the Graces’). See: Alexander Carmichael, Carmina Gadelica: Hymns and Incantations, op. cit., in the Preface by John MacInnes, p. 15, and the invocation on pp.36-37. For a very detailed discussion of Brigid, see: Tracy Boyd: “The Keepers of the Flame: Vesta and Her Brides”, under the heading “Brigit’s Birth-Fires” at <www.sacredthreads.net>.